Microorganic soap™ is a natural microorganic cosmetic for whole body care, hair, palms, feet, intimate hygiene, for every type of skin, for every age group, even for infants. Is it completely natural, safe for people and environment. Microorganic soap™ is a natural probiotic cosmetic for whole body care, hair, palms, feet, intimate hygiene, for every type of skin, for every age group, even for infants. Is it completely natural, safe for people and environment. Green Soap™ - 100 % of nature in a bar. Green Soap is intented for sensitive skin. It contains natural probiotic supplements. It has extraordinary regenerative and antioxidantic properties deriving from organic additions. Brown soap™ with bilberry and grains based on vegetable fats for combination skin type. 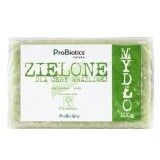 Green Soap™ is a gentle hypoallergenic cosmetic with regenerative properties for sensitive skin. Based on valuable ecological ingredients such as young barley, laur ovile oil, molasses from the sugar cane and ProBio Powder. Contains useful probiotics.